Cover Run celebrates and profiles the awesome work (both sung and unsung), of cover artists even the best interior pencillers wouldn't mind stepping aside for. 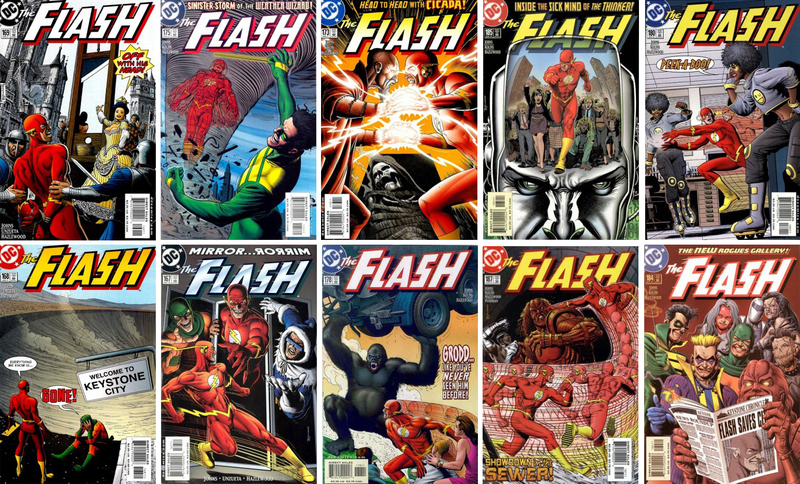 This month the spotlight turns to the imagery of Brian Bolland on The Flash vol 2 issues 164-178, 180-187. Most artists having produced any one of the covers above woud feel that they'd never top that and quit with a smile on their face. Brian's ultra detailed, eye-catching work however continued on a monthly basis for over twenty issues, with but one interruption by Jim Lee. My pick of the bunch - this one below from The Flash #164. 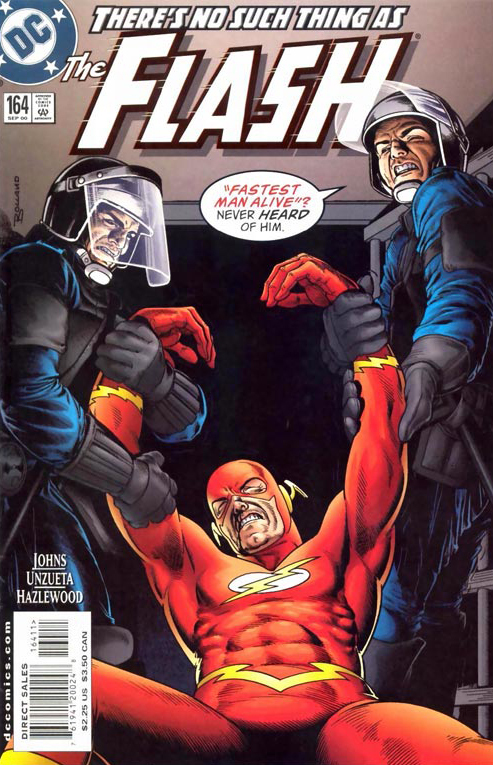 If writer Geoff Johns first ever issue on the title needed a cover you couldn't leave on the stands - this was it. For more Flash than you can handle, zoom over to The Speed Force! I love it how Captain Cold always have a red nose. 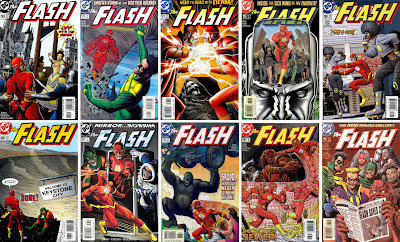 I love those Bolland covers too, especially Flash #177 which I recently displayed on Giant-Size Geek blog. I like how you displayed the gallery here. 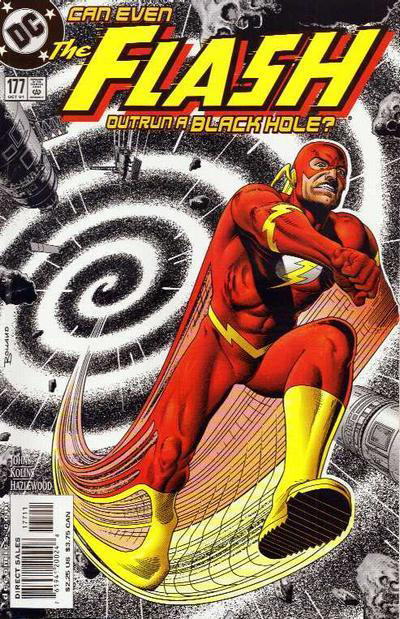 If I was the editor at DC Comics, I'd keep Bolland attached to the Flash! I'm partial to #181. There was an issue of Impulse that parodied the cover quite nicely. I just love Captain Cold Aliera - motivated by cheap booze, easy women - and morals - how can a rouge like that not stand out from the others? Hey Richard - welcome to IADW! Glad you liked the Bolland gallery too - I think Brian would suit the Flash even more now it's Barry behind the mask - as he really has a silver age feel to his work! Everyone be sure to check out www.giantsizegeek.com too - it's a pretty wicked pad Richard's got going on over there! I love that cover to Impulse too Kello! I was going to post that as a sidenote to this gallery aswell, just couldn't fit it in. I did. Great site Richard. Boland, another great artist of the 80's but i'm sure he was around before that. for some reason that Flash 164 cover reminds me of a cover for Judge Dredd who i'm sure you all know Boland did the art for as well. speaking of Dredd Dan, what's the word on the upcoming movie starring one of your fellow Kiwis Carl Urban? can i put the bite on ya fer an update mate?